﻿ IA-KAR: Green IT Solution. Energy saving software, laptop battery saver and optimizer. My battery life extends from to 2 hours to 5 hours! Extend your battery life while accelerating your computer! 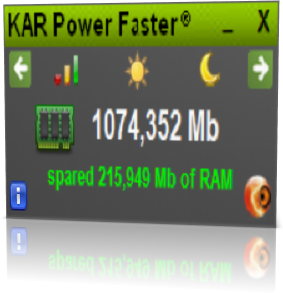 KAR Energy Software is very usefull for me! Find us on the Windows Store and download all our applications! The number of installed PCs worldwide has surpassed 1 billion units. Gartner analysts estimate the worldwide installed base of PCs is growing just under 12 percent annually. It will surpass 2 billion units by early 2014. One PC spending costs of electricity by 90$ per year and 250Kg/CO2! Carbon footprint of ICT while providing solutions to social purpose, such is the challenge that we started our business by creating our company. IA-KAR is only one in the world of Green IT to offer a solution for reducing power consumption of computers, and socially oriented solutions for easy access to computers to personal disability or for seniors. 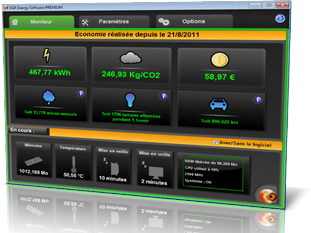 IA-KAR won awards, including the Gold Medal Concours Lépine in 2011, or the price of first eco-citizen company awarded in early 2012, Green IT solutions IA-KAR rhyme with CO2 reduction, reduction of electricity bill, optimization and longevity of their batteries and computers, social integration "disability" and ease of use and learning for seniors. For individuals as professional, as a unit or integrated, our solutions allow you to save money with an integrative approach green-friendly. This is the line of conduct we set ourselves, and this is how we envision the Green IT! Payments are carried out by E-Transaction, world leader in secure online payments and we have no access to your login and your credit card number. All transactions are secured using SSL encryption, ensuring both the identity of the paying agency and the confidentiality of data.